Warner Bros. announced today that Anne Hathaway has been cast as Selina Kyle in Christopher Nolan’s third Batman film, The Dark Knight Rises. The studio press release—which you can read in full at Deadline.com—does not specify whether or not Selina becomes her sultry alter ego Catwoman in the anticipated Dark Knight sequel, but let’s all hope she slips into some skintight leather at some point in the film. Hey, geeks can dream. The studio also announced that Tom Hardy (Nolan’s Inception) has been cast as Bane, the hulking behemoth who broke Batman/Bruce Wayne’s back in the 1993-94 Knightfall storyline. In that arc, Bane—a steroid-fueled criminal genius—freed all of the most dangerous inmates at Arkham Asylum, forcing Batman to go up against all of his most diabolical foes simultaneously. After taking Batman to his limit, Bane tracked the Caped Crusader to Wayne Manor, beat him within an inch of his life and broke his back over his knee. As a result, a wheelchair-bound Bruce was forced to hang up the cape and cowl for an extended period of time. Nolan’s made interesting choices in casting Hathaway and Hardy, and as was the case in casting Heath Ledger as the Joker in The Dark Knight, these decisions will almost certainly pay off. I thought Nolan Wanted to stay in the Realm of reality with these movies? 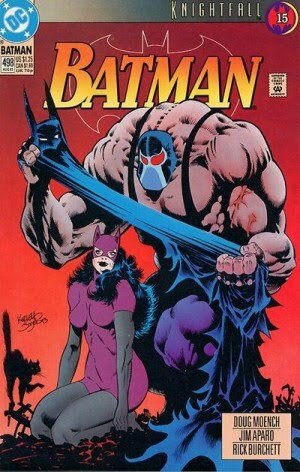 I guess steroids and cats suits are in real life, but how will Bane translate to film? I think they should use someone more like Ronnie from the Jersey shore to play bane. That i would believe. Cant you just see him holding his teddy bear Osito and screaming "I BREAK YOU!"